With all the rampant starting of projects (and willful ignoring of projects in progress - I'm looking at you River Run), I was sure I would end the month without any finished objects under my belt. 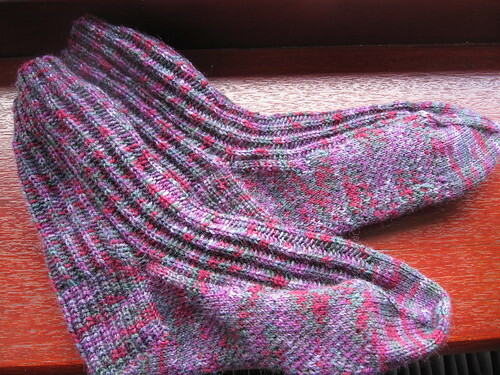 Thankfully last week's 9 hours (cumulative) on the train to and from Scotland and a trip from London to Somerset yesterday meant that last night I grafted toe #2 of my April socks while getting all weepy watching Wills and Kate on the BBC1 highlights show last night*. Gauge: I am steadfastly ignoring gauge in my socks this year because I'm largely knitting them for other people. These are for someone in the States, and if they don't fit the intended recipient, I'm sure they will find a happy home. Comments/mods: No mods from the pattern, although I knitted the large (72 stitch) size instead of the smaller version. I guess I originally thought they would be for me, but the slipped stitch/ribbing pattern coupled with a slipped stitch sole makes for a fairly inelastic fabric. They might actually fit me, but they'd probably be a bit tight, so I didn't even try. Off they go for a present instead. The pattern was very nicely laid out and clearly explained. The stitch patterns used do eat up a fair bit of yarn, and take some time. At least it seemed like it took a long time. The leg is 82 rounds long, but the stitch pattern compresses quite a bit, so they aren't very high. The bad news: I'm in Somerset, 3+ hours from London, I will be here until Monday, and I don't have the May socks with me. Aaaaaaaaaaaargh! * I was not terribly in to the whole Royal Wedding TM coverage by any stretch of the information, but was interested to see all the hoopla. Imagine my surprise when I found it all to be actually really wonderful - they were so sweet**, and I thought the whole ridiculous affair was fairly restrained as these things go***. Maybe that's a function of the Veddy British coverage that I watched - what was it like in the States? ** Must give huuuuuge kudos to Mrs. Wales, as the media circus has been unbelievable and I think she's nutso for having agreed to this whole thing in the first place. As an English friend pointed out to me, "Well, she must really love him." Amen. *** My childhood memories of Charles and Diana's wedding includes a train the length of Westminster Abbey. That might be a wee bit exaggerated, but not as much as I'd like to think. Written by porpoise On April 30, 2011 In "11in2011", "FO", "SAM", "socks"